It is no mean feat coming up with a third book! My first two books, A Week in The Kitchen and Another Week in The Kitchen, both published by Jacana Media, are both books that readers have taken to their bosoms and loved and shared and bought for aunties, dads, nieces and newly-weds. I have been humbled to hear of how my books have brought comfort and consolation and inspiration! These recipe books set in my busy little shop have for many, changed the way people are now eating. A Week in The Kitchen, carried powerful momentum: it was shot in a week in The Kitchen! We would make that food that we make every day, shoot it before the lunch rush in the natural light that bathed our tiny shop, and then we would give our shoot plates to people to eat! It was complete FUN! Another Week, carried a similar momentum and energy. How to carry that to a third book? A few years on, I find I still have so many recipes waiting to be shared. My conviction that we should be eating vegetable-led meals has not diminished one bit since 2012. Also, I have grown as a chef, creating more recipes and menus for my restaurant, The Dining Room, and feeling the confidence of being able to be the strange hybrid of a chef and “home cook” operating and exercising in the rigours of a commercial environment. I surely am still Queen of the Love Sandwich but girl, do I have more to share! Sharing is my thing! Of course, the book has to be superbly beautiful, offer tremendous recipes that are outstanding and fresh - to love and inspire! I am constantly hungry – for new ideas, new flavours, new textures. I am a curator of flavour – I know what is delicious and a know how to get there! A great respector of the integrity of every dish, I am unafraid of pulling things together! I am also blessed with the belief and support of a host of people who come to The Kitchen, hungry for what is wholesome and truly delicious: a committed army of adventurous tasters for whom I reach for some new delicious thing every day! I cherish the recipes and work of chefs and writers who have gone before me, pioneering great methods and awesome recipes that I can harness and contextualise or simplify or amend to work in my own setting. Making food that will appeal to a wide range of folk and that is easily executed by untrained chefs, make my recipes perfect for the home cook! You are looking at the most delicious of recipes that are easily achievable. I have a near religious conviction in the gathering of people around a table for a shared meal. It is my fervent belief that this is where we understand belonging. It is also the place where we may finally listen to each other. It is here that we build families and community and continue the conversation that could possibly make a difference in our fractured world. So, in my mind, any endeavour to gather the people – friends or strangers, around a table, is surely a virtuous enterprise! One that I am willing to spend my life encouraging! 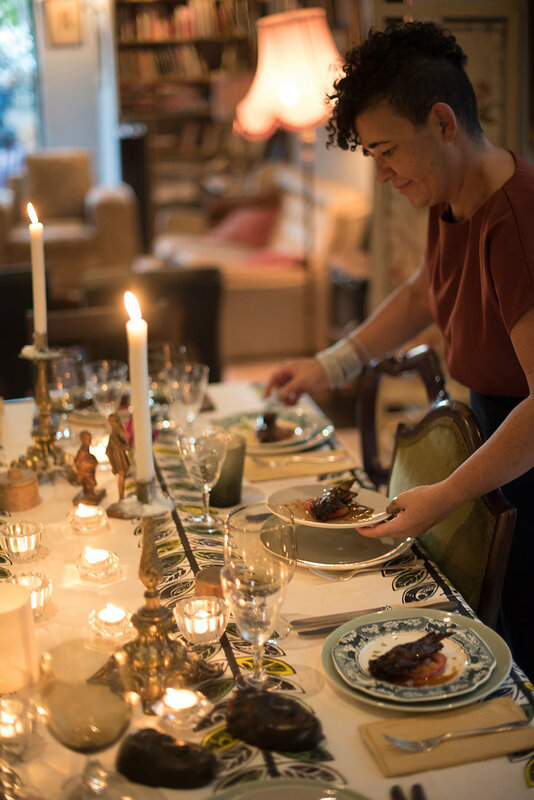 My chief thought in writing my new book, Set a Table, has been to encourage readers to create the emotional and physical space for a shared experience of something good. I present the actual recipes and all the knowledge an entertainer would need to make a gathering around the table work. Set a Table: create the space, make something simple and beautiful, lay out your cutlery and your plates and your intention.